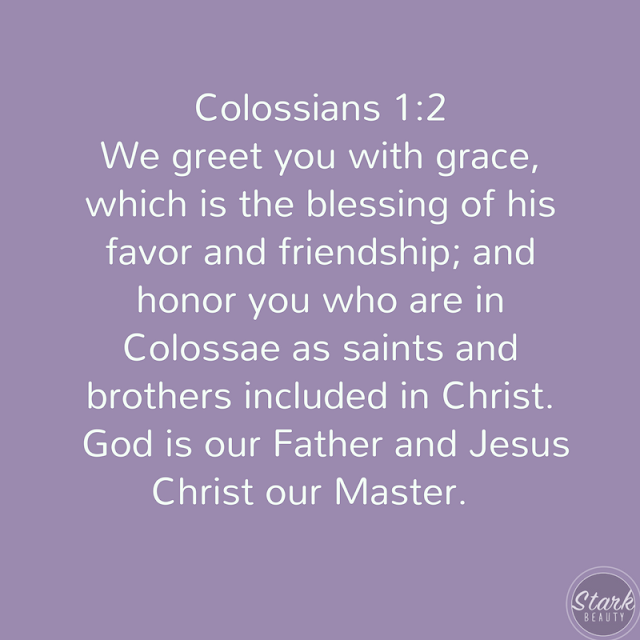 We greet you with grace, which is the blessing of his favor and friendship; and honor you who are in Colossae as saints and brothers included in Christ. God is our Father and Jesus Christ our Master. As I read through Colossians today I had to stop at the second verse and just meditate on it. It says, "God is our Father..."
That line really impacted me, I just sat and thought about it. Do I really believe that the same God who created the Heavens and the Earth is MY FATHER? Not only my Father, but a GOOD Father! A Father who loves me! A Father who would give anything and everything for me! That's YOUR father. His nature is love and today, He is lavishing that love on you. He sees you, He knows your heart, and He has great things for you. Allow Him to take your worries and cares, because He already has the answers. Your name is on His mind. He loves you! Today is going to be a great day, friends! We serve a GOOD Father.